Geography is such an integral part of the human experience. It is in our nature to desire to learn grow, and explore. The spirit of adventure is captured by globes, maps and atlases, which convey a sense of wonder. 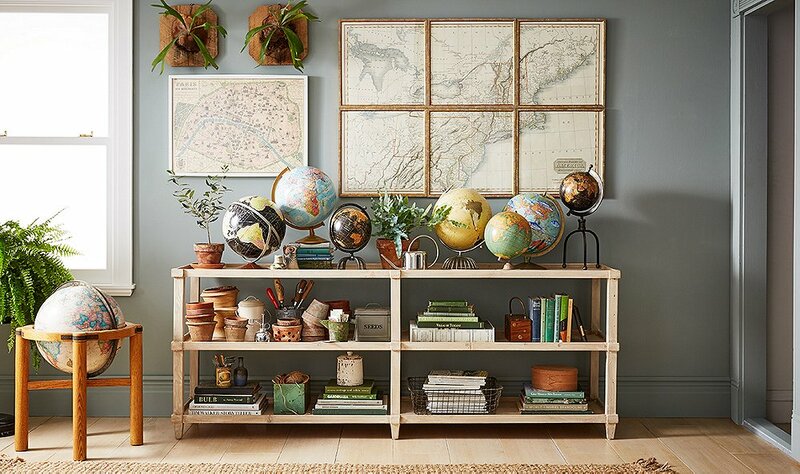 Trends and fads will come and go as it pertains to interior design, however classic, timeless pieces such as maps, globes and atlases will always be an integral part of home and office decor. Maps and globes are inexpensive and creative ways to update interior spaces. 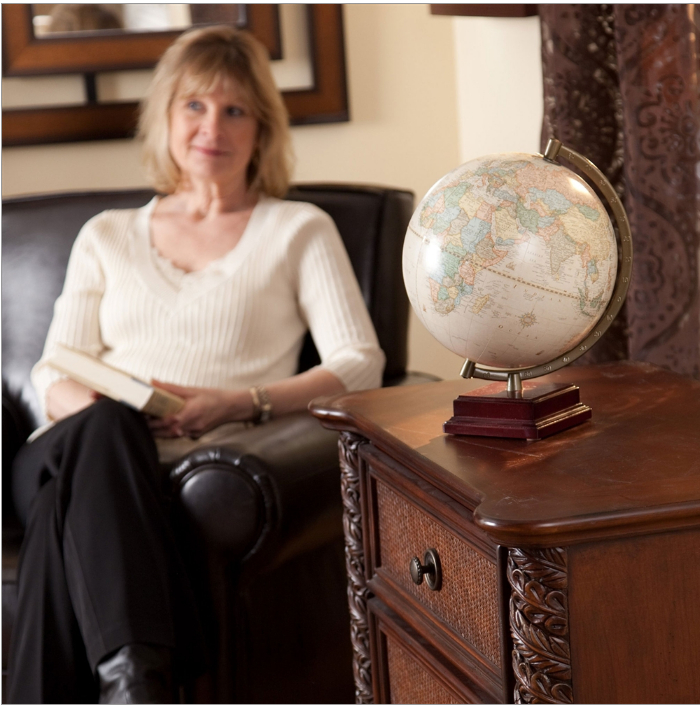 Maps and globe come in a variety of shapes, colors and sizes finding one that compliments your living space is easy. A map can serve as a unique choice of wallpaper. Apply some decoupage and your newly applied map can be used as a bulletin board for planning trips, cross off places as you visit them. In 2017, interior designers are exploring innovative types of maps and globes. A globe or map is not just a useful reference tool but an interesting piece of art and an integral component of interior design. Vintage designs, maps stencils and laser cut products will be exceptionally popular this year. Several interior designers are noting a significant shift in trends toward elegant, unique and well made products not simply mass produced knick-knacks. Home furnishings tell a story of the owner, their experiences, life paradigm and sense of aesthetics. Layers, textures and monochromatic themed rooms are making a comeback. Color theory is a significant part of interior design. A working knowledge of color theory is more than just choosing an attractive color scheme for a living space. Color theory extends to an understanding of the impact that color has on an individual's temperament, energy levels and metabolism. Individuals are impacted differently by color choices and patterns. Certain colors are better for certain living spaces than others. Warm colors such as brown, tan, orange and yellow are excellent choices for a kitchen or family room. Dark and impressive colors such as charcoal gray, burgundy, hunter green and mahogany are excellent choices for large office spaces. According to Pantone the color of the Year for 2017 is Greenery, this vibrant and beautiful shade of green is found in many of Ultimate Globes products. Greenery is an exuberant yellow-green hue that evokes images of the initial days of the spring equinox, the colorful foliage of nature is reborn. This color embodies life, flourishing flora and fauna and the proliferation of all things. This natural yet eye catching shade of green is featured in the landmasses of many of our maps, globes and other products. Cool colors such as greenery, turquoise, or violet are excellent choice for decorating bedrooms. These colors absorb light instead of reflecting it. The way the eyes perceive color, hue, shade and tint can have a significant impact on a person's mood and feelings while in a space. These are important considerations for decorating an office, classroom or home. As you decorate your home think about the elegant and sophisticated touch that a globe or map would add. The combination of earthy yet vibrant colors of most globes and maps contributes a classic and artistic flair to most interior spaces. Warm colors like brown and tan are often found in maps, our website features several models of antique style maps and globes. A 19th century map featuring a prominent city such as London would add simple sophistication above a mantlepiece or on a table. Statement pieces like this are interesting reference tools and provide historical details of years gone by. The soft outline color washes, tell a story and provide a snapshot of moment in time centuries ago. Various shades of beige will be another popular trend in the interior design world for 2017. 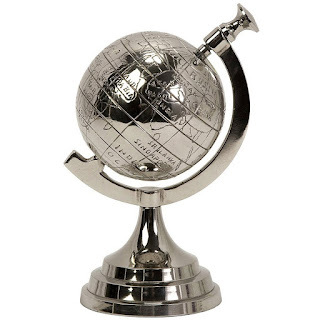 The Captain 9-inch globe is a great example of this, pictured below on a side table. The antique oceans and semi-meridian are a touch of elegance and sophistication from a bygone era. The dark rustic hue of the cherry wood is a welcome compliment to the other furnishing of the room.